Artbeat 92.1 RTRFM Radio, Perth, WA, 5 September 11am. Mahanay Bitmead, E., Here&Now14: Contemporary W. Australian Ceramics, Catalogue, Lawrence Wilson Art Gallery, UWA, Perth, WA, p3. Bevis, S., Hay Bound for Dublin, The Western Australian Newspaper, Perth, Arts Liftout, Thursday 12 June, p.7. Dublin Biennial, Catalogue, Dublin, Ireland, p.17. Gault, R., Paperclay:Art and Practice (New Ceramics), Bloomsbury Publishing, London /Uni of Penn. p.35. Wilson, L., Beneath the surface: Strengthening your work with paper clay. Clay Times, USA, Winter / Spring, 25-26. McKittrick, S., Unfold: works from paper. Catalogue for an exhibition held at fortyfivedownstairs, Melbourne, 24 April - 5 May 2012. Acton, N., Profile: Graham Hay, Pyre, Ceramic Arts Association of Western Australia, August, 5-6. The State Library Board celebrates a new chapter, 730 report, ABC TV, 7:55pm 3 August. Breeding, A., Inspired by paperclay Laguna Beach Coastline Pilot, California, USA, Friday 29 January, p. B1, B9. .
Berney, J., Artisan Profile: Breaking the mould, 96 Insite Homes Antiques Art, Scoop Publishing, Perth, Summer 2009/10, 23, p.96-98. Kennedy, L., Castaways Sculpture Awards 2009 (DVD), City of Rockingham, Exhibition and Forum Speaker. vignette during World News Australia at 6.30pm on Understory (Southern Forest Sculpture Walk), SBS Television May 9-16. Andrews, M., Blessed with Creativity, The Geraldton Guardian Newspaper, WA, June 25, 5. Radio Fremantle 97.9 Interview with Clare Molly (via international phone call), WA, April 8. Garden, W., The Art of Consumption, Redeeming the ruin... the art of Consumption exhibition Catalogue, Banyule City Council, Vic, 5, 14, 15,32. Venables, P., Celebration : the use of ceramics in the commemoration of important events, Australian Ceramics Association, Waverley, NSW. Exploring the possibility of papers, Kochi Shinbun (Newspaper), 21 February, Japan. Paper works 2006 Ino International Art Exhibition, Catalogue, Japan, p.3. Campbell-Allen, B., Beyond Earth: Exploring the plastic limits of clay, Catalogue. Students helped to create masterpiece, Eastern Suburbs Reporter, July ?, p? Ballinger, C.,What is a book?, Textile Fibre Forum, The Australian Forum for Textile Arts, 22, 1, (69), P.26-7. Spittle, D., Shock waves, artyfacts, Guardian Express, 30September - 6 October, p.15. Lebednykienė, J., (2002) XIV International Ceramic Symposium Catalogue, City of Panevėžys Gallery, Lithuania. Lightwood, A, Paperclay and other clay additives, Crowood Press, UK, 10 16 76-78 173 and cover. Bromfield, D., Review: Pomegranates and paradise, The West Australian, Big Weekend, 28 Oct, 6. Bromfield, D., Review: On Show, The West Australian, Big Weekend, 7 Oct, 6. Berney, J. Profile: Feats of Clay, The West Australia, Habitat, Oct 6, 16. The West Australia, Habitat, Oct 6, 2. New artists' studio, The Voice News, 25 March, 5. Local sculpture on deisplay, The Voice News, 30 September, 3. Evening News, ABC TV, (ACT, NSW, VIC), 30 March. Weiss, K., Review: New voices in clay, Pottery in Australia, (37), 3, 37-40. Bromfield, D., Young Idealists show their wares, The West Australian, Big Weekend, December 12, 7. Four show their art, Guardian Express, Dec 15-21, 14. Cook, R., Reviews: Hit and miss Boyd show, The West Australian, Arts Today, December 23, 6. Gault, R., Paper Clay, A & C Black, London / Uni of Pennsylvania Press, USA, Frontspiece, 10 & 96. Canberra National Sculpture Forum 98 Catalogue, 22 & 27. McGrath, J., Review: Freeing the spirit, Pottery in Australia, 1997, 36, (1), 49 - 51. Altman, J.,Review: Committed: an exploration of madness and silence through text, context and metatext, Ceramics Art & Perception, (29), 95-98. Bromfield, D., Biggles, Buddha and the fear of books, The West Australian, Big Weekend, 14 June, 7 (amended 5 July,7). Goss, B., Reading Matter Western Australia, Object, 4, 40-42. The Ways of the Seeing Places, Kiwi News, July/Aug, 6, 8. Dinham, J., Aftershock: A Review, Ceramics Art & Perception, 23, 91-95. Arts Stop Out, X Press Magazine, 486, 14. Sensible, The Voice: Curtin University, 21 February, 5. Graham wins in paper, The Voice: Curtin University, 3 April, 4. Bromfield, D. Old failings as craft rails against reality, The West Australian, Big Weekend, 29 June, P.6 (amended 17 July, 7). Arnold, E. "Platform for an Arty Departure", People Pursuits, Business Review Weekly, June 3, 102-3. Gallery Circuit, October-December, (9), 4, 8. Baxter, M. "The tertiary level reviewed." Textile Fibre Forum, 47, 17. Baxter, M. "Review: Off the Rails - or just derailed?" Craftwest, Spring, 3, 24-5. 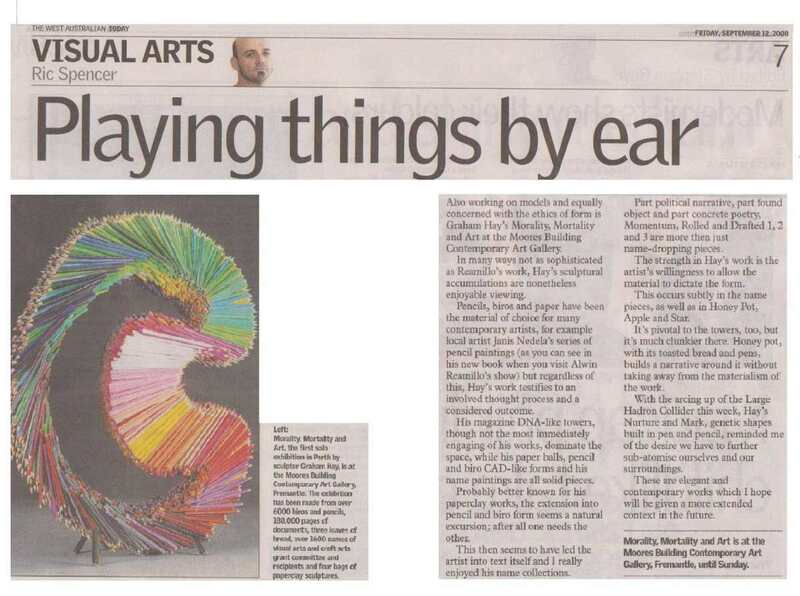 Miller, N. "Varied display of past pain and paradox" Today Arts, The West Australian, 16 Oct, 5. McGrath, J. Review: Freeing the spirit, The Western Review, November 1996, (33), 20. Hasenkam, A., Review - Diploma and Degree Shows, Craftwest, Autumn, 19. Ellery, D., Profile - Sold on Paperclay, Pottery in Australia, 34, 1, 20-21. Weston, N., Review: Out on their own, The Western Review, 15, April, 22. Snell, T., Review: In spite of the gloom, Art Monthly: Australia, 81, 18. Hickey, S., Review: Hatched, Harambee, 4, July, 19. Price, M., Review: Aftershock, The Artist's Chronicle, 45, 22. Bromfield, D., Review: Madness missing in show that is just too sensible, The West Australian, Big Weekend, 16 December, 7. Altman, J., Review: Objects, concepts and archetypes, Pottery in Australia, 34, 4, 32-34. Banks, R., Thermal Shock expo, The West Australian, Arts Today, April 22, 4. Artcraft expo, News Chronicle, April 19, 26. Visions in Brief, The West Australian, Today Section, August 10, 4. Clay and Paper Sculptured, Gardian Express, August 9, 9. Ellery, D., Making Clay while the Sun Shines… Pyre, 2. December, 6-7. Thermal Shock II Catalogue, Art and Craft Expo, Fremantle Passanger Wharf. Hay's new paper image, Guardian Express, 14 December, 25. O'Connor, M., Profile: Expressing life through Art, X-Press Magazine. 356. 15. Bryant, P. Thermal Shock, Artrage Program, PerthFringe Festival, Perth, p.6. Dinham, J., Review: Thermal Shock Ceramics Art & Perception, 11, 64-66 (copy of Thermal Shock-Review,Craftwest, Summer, 13-14).